In the financial services industry, downtime can have devastating consequences, and as companies continue to digitally transform, creating a highly available and secure environment for their customers is increasingly challenging. Data growth and increased regulatory needs are issues causing the problems around providing high availability, but they are by no means industry specific. 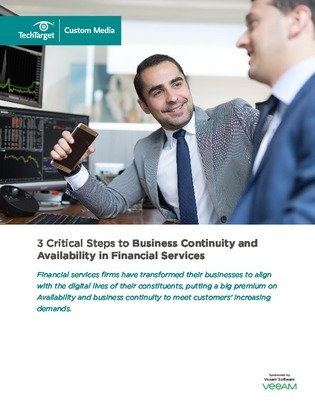 In this white paper, read about how the definition of “business continuity” has evolved not only in financial services, but across both the public and private sectors. Then learn the 3 steps that any business needs to take in order to ensure the uptime today’s customers expect.